The Liberal government’s plan to rehabilitate ISIS fighters who return to Canada is misguided and points to their perverse priorities. Our former Conservative government took strong action to combat terrorism and keep Canadians safe. It’s troubling that Prime Minister Justin Trudeau’s Liberal government doesn’t share the same priorities. The so-called rights of terrorists should never be placed above the rights and security of law-abiding Canadian citizens. 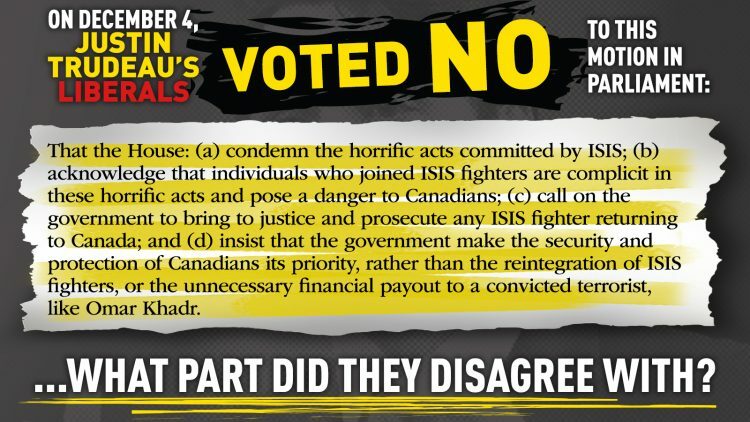 An ISIS fighter should be prosecuted to the full extent of the law if they return to Canada. (c) call on the government to bring to justice and prosecute any ISIS fighter returning to Canada; and insist that the government make the security and protection of Canadians its priority, rather than the reintegration of ISIS fighters, or the unnecessary financial payout to a convicted terrorist, like Omar Khadr. Shamefully, Liberals voted against our motion. What’s worse, Liberals are offering ISIS fighters taxpayer-funded reintegration training. Meanwhile, they are clawing back on the benefits and allowances available to Canadian Armed Forces members who are injured in the line of duty. Conservative have called – and will continue to call – on the Liberal government to enforce measures that hold terrorists accountable for their crimes and to take strong action to keep law-abiding Canadian citizens safe.